Posted January 12, 2015 by Heather Michet & filed under Food, Recipes. Forget the packaged and processed store-bought cereals that have so many extraneous (and often harmful) ingredients, a high price tag and packaging with parts that can’t be recycled. Wouldn’t it be nice to know exactly what’s in your breakfast and make it yourself in a matter of minutes for pennies? Grind up a batch of these whole grains in your blender and you’ll have created 10 servings, ready to cook up when you need a warming, hot breakfast or snack. Add all ingredients in order listed to jar of high speed blender (such as Blendtec or Vita Mix.) Mix at a high enough speed to grind grains into flour without overheating unit until you have a fine meal. Transfer to a glass jar with a tight-fitting lid for storage. Yields approximately 1 quart of dry, ready to cook cereal. 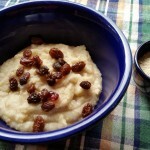 Top with raisins, a hefty shake of cinnamon and milk of your choice. You can vary the toppings as well as the grains to your liking; try using some seeds in place of one of the grains.